A wake-up Call for Owners and Leaders of Businesses! Broken Windows Broken Business is that book. Businesses get in trouble when they neglect small problems. If a window in a building is broken and left unrepaired, soon all the windows will be shattered, creating a perception of chaos. The same principle applies to business. Attention to detail demonstrates corporate competence – and that the company cares about the consumer. 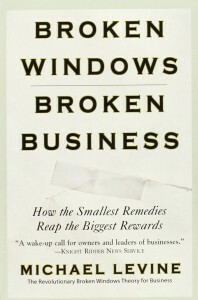 Broken windows – and peeling paint, worn carpets, and dirty restrooms – signal that the business doesn’t care. I had the opportunity to spend a few minutes with the author, Michael Levine, talking about how the smallest remedies reap the biggest rewards. What is the Broken Windows Theory – and why does it matter? What are some of the most common Broken Windows in business? What two traits that are required in order to find and repair broken windows? When you identified a broken window, but it’s not something that can be immediately repaired…what should be done? What’s the Magical Piano at Nordstroms? What can others learn from it? Why is it important they don’t have a tip jar? WARNING: Michael doesn’t hold back! His honesty is a breath of fresh air in this over-hyped, over-dramatized, world of business strategy. If you’re ready to hear the truth – and okay with being offended by what you hear – then click the play button below. Want more from Mr. Levine?